The team at GLO Bible College realised there was a need to re-evaluate the way the church dealt with young people and have a desire not only to impact the local youth in their area but also to empower churches all over Zambia in their ministry to young people. "Equipping tomorrow's leaders today". - overseeing a youth development program - "Youth Friendly Corner"
This partnership provides financial support for the various programs they run. 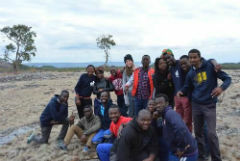 The GAP year is funded by many students being able to pay full fees while there is a scholarship program to help some youth from poorer areas attend. Funds are also sent to help with staff support. GLO has been looking for ways to help fund the Bible College activities and have been helped to install a chicken run for income generation for staff support. This was established in 2012 with the help of Riccarton Community Church. They have also produced a youth magazine for sale, and have rented out the facility and used some leadership training programs for commercial enterprises. Visiting churches, schools and other places young people hang out, highlighted to the GLO team the number of issues the youth in Zambia are facing. The schooling provided by the government is inadequate. Most classes have up to 70 pupils and often the teachers turn up drunk. Most children have a dream of what they want to be but they feel it is futile to dream because they think they have no way of reaching their goals. There is a mind-set of poverty that is difficult for them to break free of. In addition, often girls are looking for security and love in the wrong places. They think that getting married will provide them with security but often it does not as the boy they aim to marry has no means of support, or isn’t serious. Many girls have teenage pregnancies, which creates a further cycle of poverty for the children. There is not much for the youth to do to entertain themselves and this is one of the reasons for the teenage pregnancies. GLO aims to address these problems in a variety of ways through the various courses and programs that they run. However, all these programs are just a vehicle for the GLO team to get alongside many youth, disciple them for Christ and help to change mind-sets that are causing their current behaviour. They are also seeking to mentor the children with GLO students and other local church volunteers being assigned to a few children each year to spend quality time with them. 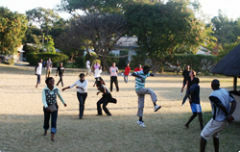 The GLO Alive team is also involved in decentralizing the youth work to other parts of Zambia. 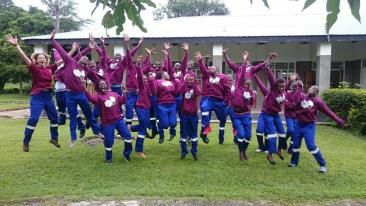 They have travelled to Northern and Luapula provinces to run leadership empowerment seminars and youth camps in those regions. In Luapula they are working with Samfya Bible School to develop leaders who will engage with the young people and meet their needs holistically. 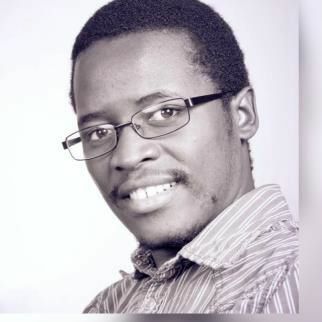 David Lukama leads the GLO team. He is married to Nanna and they have five children, Josiah, Micah, Ezra, Uhenya and Boaz. Nanna is from Faroe Islands and David from Zambia. They first met while studying at GLO Zambia in 1999. David then went on to study at the Theological College of Central Africa in 2000-2002. They were married in 2003 and then shifted to England for six years where David studied applied theology and youth work and ministry at Spurgeons College in London. In 2009 they shifted back to Zambia to join the team at GLO and have a real passion for young people in Zambia. 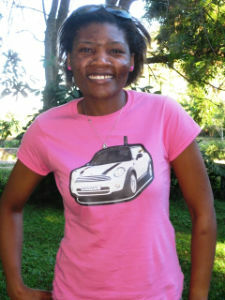 Maria Mwape was born in 1980 and is originally from Luanshya. When she was 12 years old she met a missionary lady from New Zealand who invited her to attend a youth program. By the time she was 14 she had accepted Christ as her Saviour. In 2005 she decided to take a year out from her administration job at a saw mill and attend GLO Bible College in Ndola. At the end of the course they invited her to stay for another year to help with the administration of GLO. She is still there. In September 2010 she went to GLO Bible College in Scotland for six months training on working with youth and human development. She now sees the challenge to put the information in the context of her own culture. Since returning to Ndola she has taken on the added responsibility of aiding David as GLO Zambia seeks to expand its role and service in youth work in Zambia. She is a very important part of the team and David would like her to be working full time with them in the youth department. She has great organizational skills, is good at teaching, and fantastic at organising and mentoring young people. The vision of GLO Alive is to empower young people and children to fulfil their God given potential for the sake of the Kingdom. Chikumbi is a young man who got married early in 2015 and invited David Lukama to attend the wedding. He was one of the first boys who came to GLO each day in 2010 to start to learn how to garden. He and his friend did very well in that first year and were able to increase the business the following year by having their own portion of land. 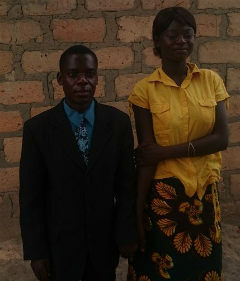 Eventually Chikumbi managed to set himself up with a small shop that supplies groceries to the community. He has never forgotten GLO Alive and the team there, how they welcomed him into the Bible college and helped to train him in farming. Humphrey was born in Chingola 25 years ago and moved to Kasama for his primary education. 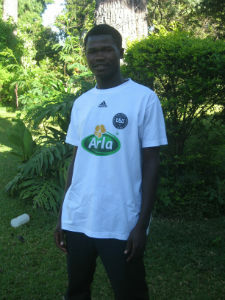 He then went to Kabwe for his secondary school education. He heard about the GLO Alive course from Isaiah Chalwe in Kasama CMML church. When he arrived at GLO he had no idea what it would be like and was expecting Bible college training, being stuck inside all the time. He found the course very useful and learnt a lot about interacting with his friends and also different types of people. He says it was hard to get to know people on the course at the start, but after spending some time together they became very close. He feels he learnt a lot about how to be a contributing member of society. He also learnt a lot about theology, and what he thinks about God and His attributes. His mentor group is run by “Uncle David” and they have some very long deep discussions. He found some of the physical activities like "rise and shine" (4 am get up and exercise) and Mwela time (the local policeman who comes on Fridays to take them for a boot camp) very challenging but he got better at them.